The train now standing at Platform 3 is … a Co-op? Rob Hopkins speaks to Alex Lawrie about Go-op, a highly ambitious attempt to create the first co-operatively owned train operating company in the UK. “I come to this really as a frustrated rail traveller. As someone who is a regular user of the railways but who always seems to end up in places that the rail network, radiating as it does out from London, fails to serve. I found myself in Somerset and I was just endlessly frustrated that I could see that train lines went from A to B, but no trains appeared to operate on them, unless, as I say, I wanted to go to London. Which sometimes I do, but often I do not. I thought, what is needed is for a train operating company that is a co-operative to start bringing ideas forward that meet the needs of people at the grassroots, and meet the needs of communities that have been isolated and forgotten about. We were able to get a little team together and we got a small grant from the Co-operative Group, bless them, and we started doing some early feasibility studies. I suppose the first conclusions that we came to were that although there were some very romantic ideas out there about re-opening branch lines and laying new track and building new stations, the blunt honest truth was that that was going to be borderline impossible for us as a small group starting from scratch to pull off. That was too advanced. That we had to find some more manageable goal to work towards in the first instance. To cut a long story short, we find ourselves in the present with a good credible route, from Taunton to Nuneaton, so that’s using that linking track through Melksham, it’s using the little cord that links Swindon and Oxford. 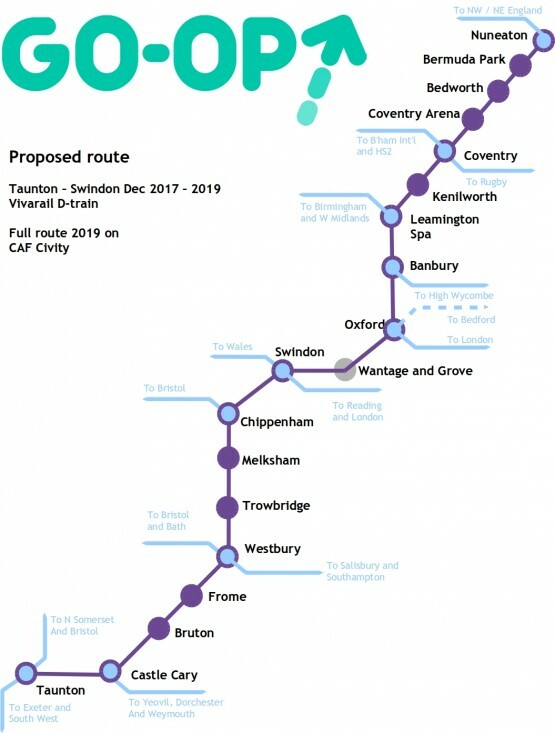 There is absolutely no convenient way at present to go from Taunton to Frome on a regular basis, from Frome to Swindon, no really easy way to go from Swindon to Oxford, or from Swindon to Coventry, and no very convenient way to go from Oxford to Nuneaton, or Oxford to Coventry. Bear in mind, Coventry is going to be one of the closest points to the high speed rail terminal for the north of England. 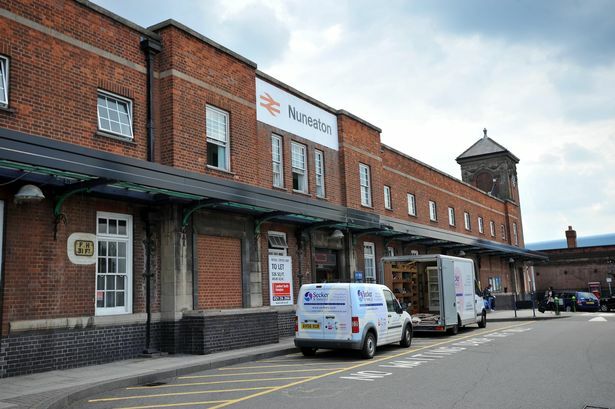 And Nuneaton is on the west coast mainline. So these are really important places to be able to get to for all sorts of longer journeys. It’s quite a clever route. Really achieves a lot of things, and the plan is to operate it with one train every two hours, which is a modest starting point, and we’ve proved that 30% of the revenue that we generate on that route will be new travellers on the rail network. People who would otherwise be driving cars. The rest admittedly will be shifting from other less convenient trains to our train. We think it’s a really good route. The stage we’re at at the moment is trying to persuade Network Rail that it will not disrupt their other plans, because if we as an open access operator want to come on to the railway, we have to prove that we are not going to cause chaos on everybody else’s timetables. That we can be accommodated within the capacity and this is where it gets incredibly difficult. The present day timetables show certain paths as being available, which we know in future either won’t be, or in the future there will be more capacity because of improvements that are already planned. To what extent does a co-operative railway offer communities along the route the potential to be involved? What would that look like in your thinking? Let’s take the example of Langport in Somerset, where I’ve been along to meet with some rail activists there, who are really keen to see a railway station opened in their town. They’ve got a very strong case for it because the 24 miles between Taunton and Castle Kerry is one of the longest stretches of track with not one single station on the route, and Langport with its neighbouring town of Somerton, is a very significant place and really does deserve a railway station. When you have a clearly expressed desire from a community, it’s realistically not possible as a rail co-operative to just say, “Yeah, sure, we’ll do that” because you have to place that in the context of an inter-locking network of obligations and responsibilities across the whole country. What instead you can do, and I think this is what we tried to do, is to give people a more transparent way to see that decision making process unfolding. To say that if your aspirations are blocked, it won’t be because no train operating country was willing to take them up, because here is a train operating company that is willing to take them up. It will be for rational reasons rather than simply your exclusion from power. We try and get people involved in the planning process in a way that they aren’t at presently. And able to say, “Well, if the private providers will not deliver this, we can”. If there are Transition groups who are listening to this who look at the map of the places that are along your route and are thinking, how could they get involved? First thing is please, join as members. We are always open to people who live along the route joining and as traveller members you don’t have absolute control – you share control with workers and there is a limited voice for outside investors, so they can protect the value of their investment – but you are the leading force within the co-operative. You’ll get a regular newsletter from us. You can come along to our AGM. You’ll be in a great position to be involved from the outset if we can make it through this regulatory process. People who don’t live on the route but do have issues with the railway network in their area, I would very much encourage you to go down the route we’ve gone down. I’ve got to warn you in advance, this is not for the faint-hearted. It’s an order of magnitude more difficult than say setting up a community solar farm or one of these other more well trodden paths. One of the interesting things that’s happened lately is a company called Viva Rail has started building diesel multiple units from repurposed London underground carriages. Now these are very basic things. They can only go at 60 miles an hour. They are fairly modest rail vehicles, but they are just perfect for a really small scale route. If for example you’re wanting to improve a rather patchy branch line service, or just create a really little local shuttle somewhere on rail track that already exists between stations that are already there but just very poorly served, then the D-train might be the way for a local community rail group to put together a small scale achievable proposal which could make it through the Office of Rail and Roads regulatory processes. What do you think your project, and others, tell us about the scale of ambition, the scale of what’s possible within the co-operative movement in 2017? I do not think that we should be afraid of thinking big. This comes with risks. I was involved peripherally with a really tremendous project called the Energy Saving Co-operative, which was going to be systemically installing insulation in homes across the Midlands. A fabulous project. It came to grief, collapsed, investors lost money, very very sad end, and we have to be prepared for that to happen from time to time. Because if you’re going to be big and bold and audacious, and I think the times call for a degree of audacity, then you also have to be prepared to accept occasional failures as the price for that. I think indeed we do need to have what you might call a slightly more Californian attitude to failure, that failure shows you’re trying, failure is how you learn. The important thing is that we collect that learning, that it doesn’t get lost and we’re able to apply it again in the future. I’m looking forward to the next co-operative trying to solve the problem of energy conservation and learning from the experiences of the Energy Saving Co-op. The key to it is going to be building up a community of people who have the will and the experience and the skills to act as Directors of increasingly large and ambitious social enterprises. If there is one limiting factor in the community at the moment it’s a shortage of people able and willing to sit as Directors on the boards of community enterprises. We need to be creating almost like a career path that people can follow, progressively building on the experience, learning from relatively small scale projects to take on larger and more ambitious ones. I think of it as an invisible university. An invisible department of business studies where people are learning about the operation and the planning of complex social enterprises in the most hands on and practical way possible. And that we are able to get people emerging from all backgrounds and all sections of the community to do that. Insofar as we are able to find people to sit on boards at the moment, there is a terrible dominance of the older, white men, and bless them, sterling folk all and doing tremendous jobs, but our communities have so much more than that to offer. And so we really do need that. Get involved in a smaller community enterprise. That was a good experience. You achieved something, you learnt something, now take on something a bit bigger, a bit bolder, and so on. Last question. Where are you at with the rail line? If all your ducks end up in a row, how long before the first train from Taunton to Coventry might be? As we speak today, we are at a very delicate point in the process. Our timetable has been studied by Network Rail and their current position is that it does not perform against the 2016 timetable well enough for them to give it their support. Now we have a choice to make as to whether we continue putting alternative proposals to them and trying to find proposals that they are willing to support, or whether we go over their heads to the Office of Rail and Roads and appeal for the ORR to direct Network Rail to issue us paths. Which they will do if they feel that the public benefit requires it. The next few months are going to be absolutely critical but let’s see what it looks like if we are successful. If we do make headway, then somewhere around the early autumn there will be a launch of a really big community share offer, really on a vast scale. The largest of the community shares offers. That will then be followed by a process of organisational development as we establish our staff team, recruit drivers. 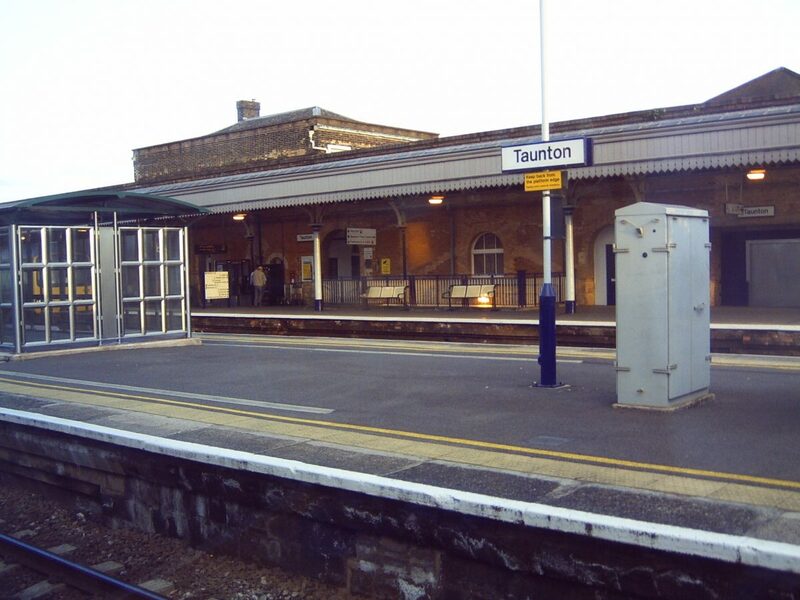 We would begin operating the first services maybe May 2018 on a restricted part of our route between Taunton and Swindon and then somewhere around the beginning of 2020, we would open up the full route all the way from Taunton to Nuneaton. The first few years of the contract we would lose money, the remaining years we would make money, and then we would have a nice pot of cash to invest in the development of further train lines. So that’s the best case scenario. Book Review: ‘How to Save Town Centres’ by Julian Dobson.